The ostrich is a very unique bird and happens to be the only member of its family, Struthionidae. It is the largest living bird in the world, weighing 287 lb on average and reaching a height of 6.5 feet. Some males have weighed as high as 340 lbs. The ostrich has a long neck and legs, and its feet touches the ground with two toes only. Their legs are very powerful and can cause serious injury if used to kick a human or predator. Males have soft black feathers on the back and white feathers on the wings and tail, and females and their young are brownish in color. Ostriches are the fastest moving birds on land, reaching speeds of up to 40 mile per hour. Their speed, alertness, and good eyesight help them to escape predators like hyenas and jackals. It is a common misconception that ostriches bury their heads in sand, but they are only known to lie on the ground with their necks outstretched to escape detection from predators. The ostrich is able to survive for long periods without water. They prefer flat areas where there is very little rainfall for their habitat. However, they are very fond of water, and are seen taking baths frequently. Diet consists mainly of shoots, leaves, and flower seeds, but they may occasionally feed on insects and animal remains left by carnivores. Ostriches are not very social, and prefer to live alone, although groups of 5 to 50 birds may travel together with other grazing animals, such as zebras or antelopes. Males compete and form their own territories that may contain three to five females to mate with. Mating occurs in the dry season, and the female lays up to 12 eggs after a gestation period of 35 to 45 days. The male and all breeding females in their territory care for the young, and more than one female may share the same nest. The eggs are incubated for six weeks, and when they hatch, only the male tends to care for the hatchling. Up until the mid-20th century, ostriches were found in southwestern Asia, the Arabian peninsula, and Africa. Today they are only found in central and south Africa. A small number of them can be found in Australia (introduced by European settlers). In the past, they were hunted and farmed for their fine feathers and skin (for making leather), nearly wiping out the entire species. Two ostrich subspecies are listed as endangered: the West African ostrich (S. c. spatzi) of the Western Sahara, and the Arabian ostrich (S. c. syriacus) once found in Jordan and Saudi Arabia. Both are believed to be extinct since the 18th century, although there have been unconfirmed sightings in the 19th century. Today, ostrich hunting is less of a problem since the demand for their feathers are not as great as in the past, and therefore all surviving species seem to have secure populations. Copyright Notice: This article is licensed under the GNU Free Documentation License. It uses material from the Wikipedia article "Common ostrich". Glenn, C. R. 2006. 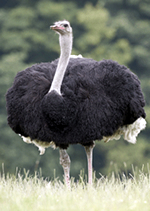 "Earth's Endangered Creatures - Ostrich Facts" (Online). Accessed 4/23/2019 at http://earthsendangered.com/profile.asp?sp=309&ID=8.